Katie was impatient to get started. "Riley, come ON!! We're going to be the LAST ones knocking on those doors. All of the GOOD treats will be GONE!" The threat of being denied snacks brought Riley racing to the door. His mask was crooked, and he promptly bumped into the wall as he tried to straighten the holes back over his eyes. Katie smiled. What a costume! He was dressed all in black, with a cape that whipped in the breeze, a flat-brimmed hat pulled low over his eyebrows, a black mask covering his face and muzzle, and a long rapier hanging at his side. She straightened her red feather boa and shook it vigorously under Riley's nose. "Come on, Z-man, let's go beg for goodies!" The two scotties skipped out the door and down the sidewalk. They made quick work of the houses in the neighborhood as the pile of treats and goodies in their pumpkin pails grew larger and larger. They waved happily to friends they passed on the sidewalk, and stopped often to compare the amount of treats being collected by their pals. Katie and Riley stopped as they reached the end of the sidewalk. They looked at each other, then their gaze returned to the road that stretched off into the darkness in front of them. They had heard stories of what happened to wee scotties who ventured too far down this road. They knew that they were NOT to go past the end of the sidewalk. The pavement ended here, and only a dark, dusty lane lay ahead. "Well......if we're going to go explore that old mansion that they say is at the end of this road, this is the PERFECT night for it!" Katie smiled. Riley eagerly threw his cape back over his shoulder, and swaggered forward into the darkness. "Come on, sis. Let's go chase some ghoulies!" The two scotties trotted excitedly down the road. Dust rose under their paws as they padded eagerly onward into the darkness. The trees that lined the dusty lane closed in overhead, blocking the meager moonlight visible overhead. The shadows lengthened, as the wee adventurers scampered ahead. The wind moaned as it rattled through the skeletel branches of the trees overhead. And, still, the two scotties sauntered boldly down the dark, lonely road. Katie and Riley were momentarily surprised as they stepped into a clearing, the moonbeams shining brightly into the opening among the trees. In front of them, loomed the crumbling remnant of what once was a huge mansion. They could see that the building had been abandoned for years... the roof had collapsed in several places, the massive doors hung precariously on rusted hinges, the great palladian windowpanes had long since shattered, leaving the threadbare draperies to billow through the huge holes in the crumbling walls. "WOW!" Riley whispered gleefully. "A REAL haunted house! Let's go chase a GHOST!" He playfully pushed Katie with his paw, knowing that it ALWAYS succeeded in goading Katie into action. He smiled... she had not disappointed him. "Ghosts, schmosts! Where do you see a ghost?! All I see is some crumbling old building that'll probably fall down around our furry little ears, brother DEAR! But, I'm up for it if YOU are. Let's GO!" And with that, the two terriers trotted fearlessly up the once-grand staircase to the massive entrance. The huge door was hanging by a single, rusted hinge. Riley wriggled through the small opening in the door, with Katie right behind him. They stopped in what was once the foyer of the mansion. Now, only cobwebs decorated the decaying wood paneling. A chandelier hung precariously from the ceiling. The two scotties tried to peer down the long hallway that extended into the distance, but the gloom and darkness shrouded the interior in a black haze. "How do you expect to explore this CAVE without a flashlight or a lantern or ANYTHING that would shed some LIGHT on our little adventure!" Katie stood with her paws on her hips, one paw tapping impatiently. "I have no problem with exploring this place. It IS interesting! And, did ya notice that old fountain outside? It had a SCOTTIE in the center!!! This IS a great place to explore. But, Riley... really, we need to go get some LIGHTS. We'll get lost in here and end up wandering forever up and down these dark, dingy halls!!" With a wicked gleam in her eye, she added, "And YOU will miss supper, m'lad!!" "You're right, I know. But, I sure hate to walk out on a chance to do some tracking. No TELLING what kind of critters are living in here!" As if on cue, they heard a low moan. It seemed to come from above, and as they looked up, they saw the chandelier begin to sway, slowly at first, then faster and faster. The moaning grew louder, creating a deep, rumbling vibration that seemed to go right through the two scotties. Katie had a paw on Riley's arm, tugging frantically. "MOVE!!! It's gonna fall!" Katie screamed. The moans intensified until the walls began to shake with the incredible noise, and it was then that the once-graceful chandelier lost its delicate hold on the ceiling and came crashing to the floor. "Okay, what was THAT all about!?!?" Riley asked. He and Katie crowded closer to the ruined chandelier. The chain that had once held it to the ceiling had snapped, as if it had been CUT! A blinding light suddenly bathed the dark, gloomy foyer in an irridescent glow. Katie and Riley turned toward the source of the light, holding their paws over their eyes to protect them from the intense light. 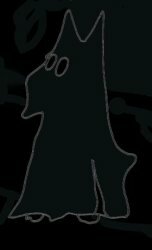 They saw a gauzy shape descending the staircase, stopping occasionally to touch it's neck, that seemed to be the source of the light. As the misty shape neared, Katie whispered to Riley, "Hey, it looks like an old woman. It looks like Opie's Aunt Bea! That light is coming from HER!!! LOOK!" Riley stepped closer to the bottom of the staircase to get a better look. The spectre lifted a wispy arm immediately Riley was unable to move any farther up the stairs. It was as if he had walked into a brick wall. Nothing was in front of him, nothing to impede his progress, yet he could NOT advance any closer to the ghostly apparition. Katie grabbed Riley's paw and pulled him away from the staircase. "She doesn't want you up there. I think we should honor her wishes." Then, Katie looked closer at the shadowy image. "LOOK, Riley. What's that around her neck? THAT'S where the light is coming from... she keeps touching something around her neck." Riley and Katie were entranced by the vision on the staircase. They felt no fear, there was no danger, there was no sense of foreboding, only the intense feeling that they had invaded a private space. They watched the ghostly spectre as she floated farther down the stairs, where she looked intently at them and mouthed the single word, "GO". Riley nodded to the ancient-looking image, then turned to Katie and said, "I think we've been asked to leave. It seems that we've overstayed our welcome. Come on, Sis, let's leave her to her memories." Katie agreed, and as they reached the massive door, they turned back for one last look at the elderly spectre. She was floating back up the stairs, stopping occasionally to adjust whatever she had around her neck...that was creating the intense glow. Then, the light faded.....and the wispy spectre disappeared, as if she had never been there at all. "Oooooookay," Katie said, as they squeezed back through the opening. "THAT was different!" Riley laughed. "And WHO do you think would ever BELIEVE it if we TOLD 'em!! They'll just think we're making stories UP again!" Katie and Riley chatted excitedly about their ghostly encounter as they walked back up the dusty road. Their eyes shown with excitement as they tried to recall EVERYTHING, wanting to commit every detail to memory. As the two scotties reached the end of the dark, shadowy, dusty lane, they failed to notice the rusted, wrought-iron gate lying to the side of the path. Grass, weeds, and forgotten honeysuckle had claimed the once-beautiful wrought iron and covering it forever. Only if one looked very closely, could they make out the few letters still intact - "Sco--in--on F--r". Neither of the scotties noticed the ghostly image that emerged from the darkness, dressed in tattered butler's finery. The wispy figure reached for a spectral gate, then closed it securely behind the departing scotties. And they SAY...... that if you DO find this dark, dusty, shadowy lane... and travel all the way to the END of the lane... that you will encounter the Spectral Ghost and her Cherished Light. BUT, do not EVER invade her space and climb the stairs.... that would be a mistake of GHOSTLY proportions! THE End ..... IS IT?? ?